Google Earth the postcode LL48 6EH and see the fantastic location of this lodge! 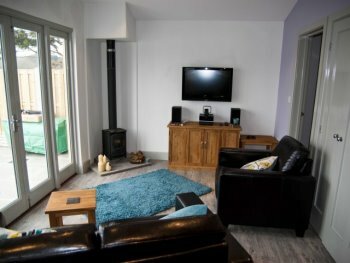 This lodge has been lovingly created to compliment the magnificent location it occupies. The interior finishes and fitting out will be completed early in the 2010 to the highest standards. Absolutely unique and exclusive location. Situated on the waterfront on the Dwyryd River Estuary/ Tremadog Bay, along the beach from Portmeirion Italianate Village. Open plan kitchen, Dining and Lounge with beautiful views along the estuary offering total privacy. Just 5 minutes drive to Porthmadog and 2 mins to Ffestiniog Steam Railway and central for all Snowdonia attractions. 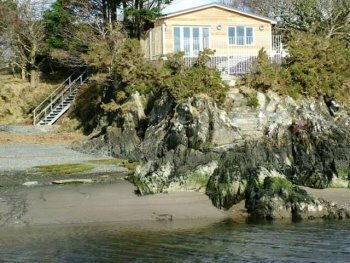 Enjoys wonderful seclusion with breathtaking views, sunrises and sunsets, private steps to beach and waters edge. Fabulous bird and wildlife, perfect for photographers, artists, fishermen, walkers, water sport enthusiasts, launching for small craft immediately adjacent to lodge subject to tides. 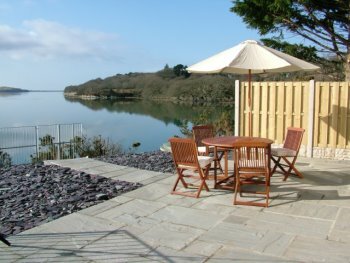 Renowned fishing spot for Bass, Sea Trout and Flat fish, cast in from your own terrace! One bedroom (sleeps 2) with en-suite facilities. Hall, cloakroom w.c, kitchen/diner/lounge, with log burner and wide French doors to large terrace. Private filtered spring water pumped from 250ft underground. Eco friendly bio waste system. Available for long (1 month) or short (4 day or less) lets.